Known only by the internet handle "TipsForJesus," a stranger has been posting Instagram photos of generous tips that now add up to well over$80,000. One of the most recent of which was delivered to the NoMad and Bo's Kitchen & Bar Room this past weekend for $7000 and $1000, respectively. 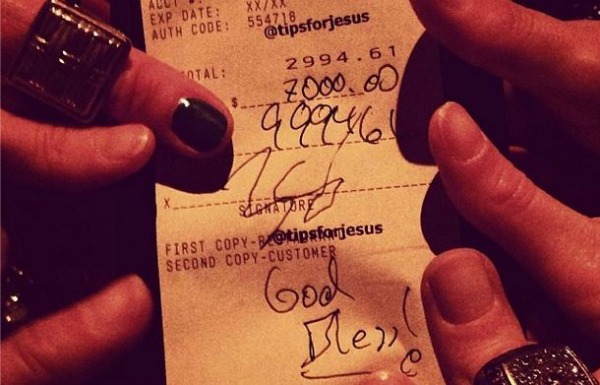 TipsForJesus was previously spotted leaving a $3,500 tip at the Smith, a New York-based Restaurant, last week. TipsForJesus has been surfacing in many places, from Chicago to Los Angeles to San Francisco, and he/she/they don't seem to be planing to stop their random and unpredictable acts of kindness. Some have predicted that these spontaneous, extraordinary tips are being carried out by Jack Selby, a former Paypal executive. So next time you find yourself on the wrong end of a long shift at your restaurant, don't despair! Know that at any moment your day could be made a little bit brighter.